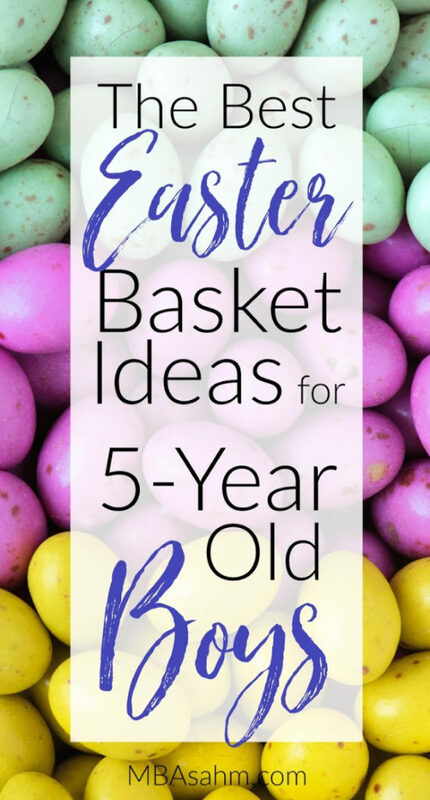 5 is such a fun year and these Easter basket ideas for 5-year old boys will make Easter morning even more enjoyable! My son gets so excited for the holidays, so surprising him with an amazing Easter basket is one of my favorite parts of the day. I have so much planned this year, so I hope these Easter basket ideas are helpful for you too. There’s something for everyone (and every budget), so I’m sure you’ll find something perfect for your 5-year old boy. Good luck with your shopping and happy Easter! Preschoolers and kindergarteners are knee deep in crafts, so arts supplies are an awesome idea for Easter basket fillers for 5-year old boys. I gave my son some glitter glue pens for his 5th birthday and they were such a huge hit that he’ll be getting ANOTHER set in his Easter basket…because they went that quickly (and another reason arts and crafts are awesome Easter basket ideas…they don’t last forever!). Monster spray turned up in my 5-year old son’s stocking this year and it was one of the biggest hits of the whole holiday – he is obsessed with it! The concept is simple, but brilliant – your 5-year old boy simply sprays the Monster Spray around his bed or closet before bed and it will keep all of the monsters away. This is such a fun Easter basket idea for kids! Your 5-year old will definitely love it. What good is an Easter basket for a 5-year old boy if it doesn’t include an Easter Lego set?? For us, there’s pretty much no chance the Easter bunny will be arriving without LEGOs. This is one of my favorite Easter basket ideas for 5-year old boys – glow-in-the-dark star stickers for their bedroom ceiling! This is a really fun idea (that doesn’t involve bells and whistles) and one that won’t break the bank. Not only are 5-year old boys interested in outer space, but this will help them sleep in their own rooms! Summer is coming! And nothing says “Hello Summer!” like a new pair of flip-flops. For some reason there’s a really exciting appeal to flip-flops, so most 5-year old boys will get really excited about this Easter basket idea. Sunglasses are such an adorable addition to an Easter basket and a great way to get your 5-year old all set for summer. You can go stylish or practical, but it doesn’t really matter because either way, your 5-year old boy will be so cute in a pair of sunglasses! Sidewalk chalk is the perfect Easter basket filler for 5-year old boys. It’s such a great way to get them outside and you always need more of it, so why not start stocking up now! I’m not a huge fan of giving kids pretend weapons, but water guns can be a lot of fun and nothing beats a good outdoor activity that can cool your kids off! This is also a fun addition if you have more than one child because it’s something they can do together (as long as you get one for each of them, of course!). No 5-year old Easter basket is complete without at least one pair of fun Easter socks! This is another practical Easter basket addition that is still really fun and exciting for little boys. It’s hard to find Easter-themed socks for 5-year old boys, so I like opting for other fun socks that I know they’ll love! This pair is really adorable and the one that I’m using this year (they’re mismatched on purpose and soooo adorable!). Bubbles are another outdoor essential for boys, as well as another way to welcome spring summer in your Easter basket. You can get some elaborate bubbles (like a bubble gun!) or basic ones…or go all the way for a bubble machine if you don’t already have one. My son is obsessed with pajamas, so there’s no question he’ll be getting an adorable summer pair from the Easter bunny! Pajamas are great Easter basket fillers for 5-year old boys because you need to get them anyway and it’s a great time to switch seasons. My son’s (and my) favorite summer pajamas are definitely Kickee Pants. They are the softest material ever and extremely lightweight. They have a ton of fun designs and are finally being sold on Amazon, so depending on the design you choose, you can get them on Prime (this is a major score in my book ;-)). 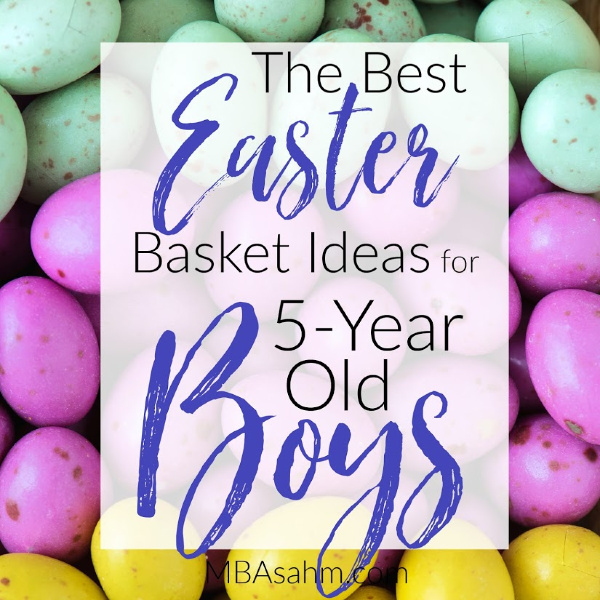 I hope these Easter basket ideas for 5-year old boys find their way into your home this year! Have a great Easter and enjoy every minute.